The three provincial-level regions have signed a deal to jointly promote the regions as tourism hubs to boost their economies. 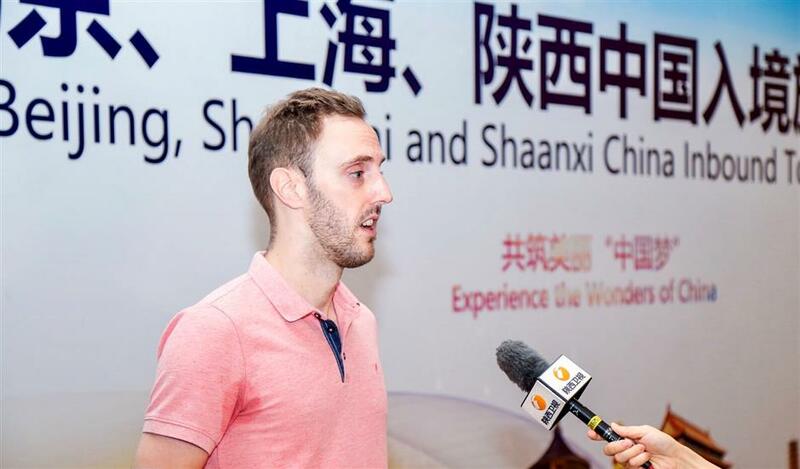 A foreign tourist is interviewed in the ceremony in Xi'an on Thursday to launch a new tourist hub program. Shanghai, Beijing and Shaanxi Province plan to establish themselves as inbound tourism hubs, with support from travel agencies including the country’s top online travel agency Ctrip. It is the first inter-provincial cooperation plan for inbound tourism which helps promote Chinese culture and boost economic development in the regions, government and industry officials said on Thursday. A memorandum of understanding signed by the three provincial-level regions on Thursday calls for an annual conference to share experiences and a special fund to promote and develop inbound tourism in the regions. The hubs will “tell Chinese stories, spread Chinese culture and showcase the wonders of China,” which will boost the economy and cultural development of the provinces. The number of tourists visiting China reached 139 million last year. Shanghai, Beijing and Shaanxi have modernized transportation networks, advanced information infrastructure and world-class attractions such as the terracotta warriors in the Shaanxi capital, Xi'an, and the Great Wall. With advanced technologies like artificial intelligence and big data analysis, Ctrip will integrate inbound tourism resources, Ctrip’s destination marketing division said.